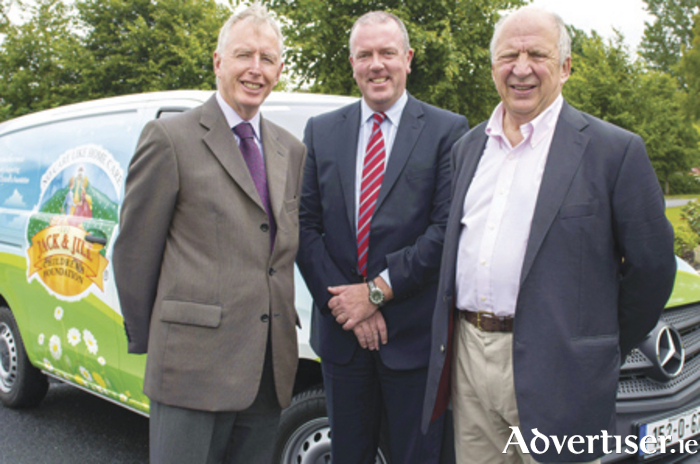 Mercedes-Benz Chief Executive Stephen Byrne and Commercial Vehicles Sales Manager Fergus Conheady are pictured with Jack & Jill Foundation CEO, Jonathan Irwin, at the handover of a new Mercedes-Benz Vito van to the foundation. The work being done around the country by the Jack & Jill Foundation to provide home nursing care and end-of-life care to children with life-limiting and life-threatening conditions has been acknowledged by Mercedes-Benz in Ireland. Noting the organisation’s ongoing need for a vehicle with load-carrying capability for the charity’s new venture into charity boutiques, Mercedes-Benz Commercial Vehicles Sales Manager in Ireland, Fergus Conheady, has provided the foundation with a new model Mercedes-Benz Vito panel van. Operating from the organisation’s headquarters in Johnstown, Kildare, the new Vito will be put to work transporting items between the foundation’s three charity boutiques in Naas, Newbridge and Arklow and thereby providing much-needed support for the charity.